The Framingham label was launched in 1994 with one Riesling, and has since expanded to include Sauvignon Blanc, Pinot Gris and Pinot Noir. Framingham produces wines from their 19.5 hectare estate vineyard (certified organic since 2014) and other selected sites. Their Riesling vines, planted in 1981, are among the oldest in Marlborough. Winemaker Dr Andrew Hedley joined Framingham in 2001, bringing with him an obsession with – and a reputation for – making great Riesling. Indeed, Jancis Robinson MW hails Andrew as “one of the most skilled practitioners of Riesling anywhere in the world”. Grapes for the 2017 Noble Riesling were selected from the 36 year old organically grown vines on the Framingham estate vineyard. Soils there are of the old river bed type; fist sized stones composed of greywacke (a hard, dark type of sandstone streaked with quartz and feldspar) mixed alluvial gravel and silt. Vineyard practice for this wine is geared to produce ripe grapes that have had maximum “hang time” on the vine. 2017 was a relatively difficult vintage in Marlborough. Unprecedented amounts of precipitation through the growing and picking season meant that disease was an ever-present threat. Low crops on Framingham's three Riesling sections around the winery meant that fruit was soft (and therefore, more susceptible to botrytis infection) quite early on. Selective hand harvest took place between 21st April and 3rd May. Net brix 34.5 (151 Öchsle). The wine is blended from six Auslese picks. Bunches were selected with largely 100% botrytis affected berries, though most were in the relatively early stages of dehydration and not yet fully raisined; the remainder were just turning in colour with early botrytis bloom. Net botrytis influence was difficult to judge, but is significant! The wine was fermented in stainless steel (55%) and oak barrels (45%) before the final blend was composed. 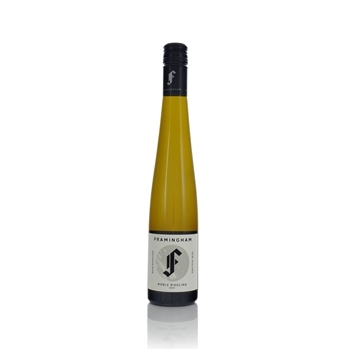 A sweet, botrytis affected wine inspired by the classic German “Beerenauslese” style. The wine is deeply concentrated, yet elegant and not cloying as a result of its vibrant acid and naturally low alcohol. Aromatics of orange citrus, apricot, marmalade and cream with a rich mouthfeel and extract, lots of stone fruit and zesty flavours, all held together with the bright acidity. Tense and juicy on the finish. "A notch sweeter than the Auslese, the 2017 Noble Riesling weighs in at 180 grams per liter residual sugar. This medium-bodied wine features intensely sweet and somewhat monochromatic flavors of candied pineapple and honey, only partially balanced by chalky notes on the finish."